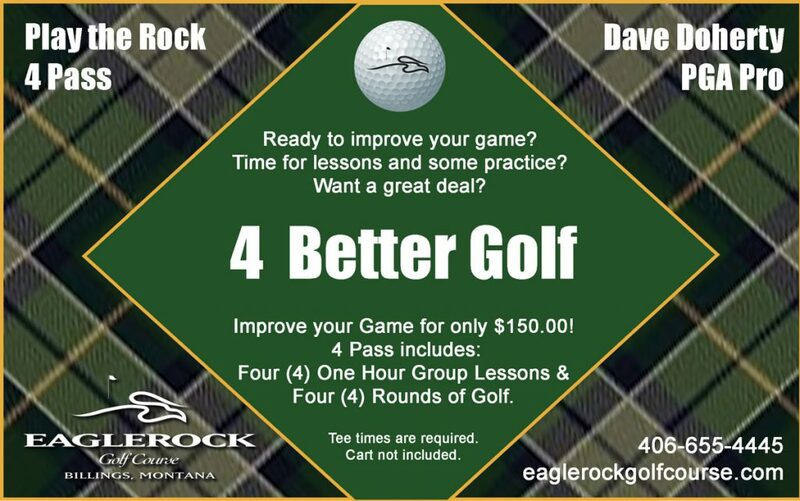 For yourself or a perfect Fathers Day gift, the “4 Better Golf” pass includes four (4) GROUP lessons with one of Eaglerock’s PGA Pros, Dave Doherty or Marv Clover, plus four (4) 18 hole rounds of golf. 4 for you or bring a friend and share the experience. SAVE over 50% – This is a terrific deal! Improve your game for only $150. Rounds of golf are good any time Monday through Friday and after noon on the weekends and holidays. Group Lessons will be held Tuesday nights, with two sessions 6-7pm & 7-8pm to better fit your schedules. Call the Eaglerock Pro Shop at (406)655-4445 for more information.